Cisco Meraki have a full range of networking and security solutions that mainly distinguished and designed to be out of the box ready with quick and easy deployment that does not require any training. Customers also have immediate access to centralized cloud control tool that provide administration, network diagnostics in real-time, customized reporting, and continuous monitoring of all networks and components. Switches Solutions:Cisco Meraki access and aggregation layer switches provide the backbone for networks of every size, combining secure, scalable, robust performance with an elegant, intuitive management experience. 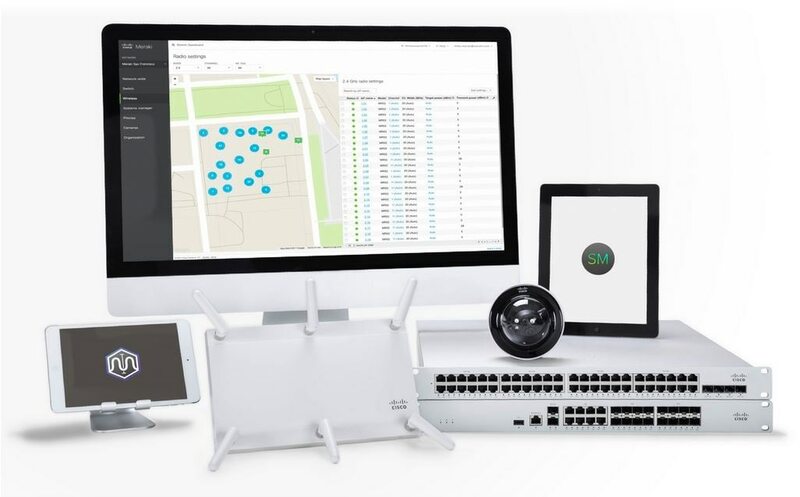 Wireless Solutions:Cisco Meraki access points are built from the highest grade components and carefully optimized for a seamless user experience. The outcome: faster connections, greater user capacity, more coverage, and fewer support calls. Security Solutions:Cisco Meraki Security Appliances can be remotely deployed in minutes using zero-touch cloud provisioning. Security settings are simple to synchronize across thousands of sites using templates. Auto VPN technology securely connects branches in 3 clicks, through an intuitive, cloud dashboard. System Manager:Cisco Meraki offers the only solution that provides unified management of mobile devices, Macs, PCs, and the entire network from a centralized dashboard. Enforce device security policies, deploy software and apps, and perform remote, live troubleshooting on thousands of managed devices.